AVer offers schools the flexibility to create customized teaching and learning solutions. Capture Your Lecture in True-to-life Video Quality. Available in white to suite your hospital, classroom, or wedding atmospheres. AVer's Classroom Video Conferencing is specifically designed for the classroom to help schools enhance students’ education. 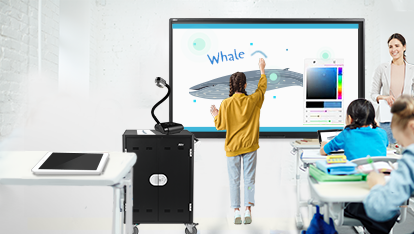 A new generation of future classroom solutions was displayed at the 2017 Taipei Education ICT Forum with the debut of the AVer interactive flat panel. AVer IFP brings an intuitive design to increase learning in the classroom. Industry leading multipoint video conferencing system connecting between skype for business, SIP, and H.323 simultaneously. The AVer Visualizer not only helps to raise the interests of students, but enhance the learning effectiveness of the class. AVer C20i Charge Cart is specially designed for small to medium-sized classrooms, featuring a compact design and AVer’s famous intelligent charging technology. 10 different schools in Vietnam, Thailand, Russia, Poland, and Taiwan Make Friends!! Meet the CAM340 – the next generation of intelligent USB3.0 ultra HD 4K huddle room camera that gives you the freedom to express yourself and collaborate anywhere. AVer and ATEN worked hand in hand to upgrade Nan-Hu Elementary School's Future Classroom. VC320 conference camera. Portable All-in-One conference camera for video collaboration. CC30 HD Camera is the first high-quality lecture camera especially designed to help schools enhance students’ education. The brand new EVC950 intro. AVer CC30 HD Camera enhances the distance learning experience. The brand new new eCam PTZ camera for EVC150, EVC350 and EVC950. 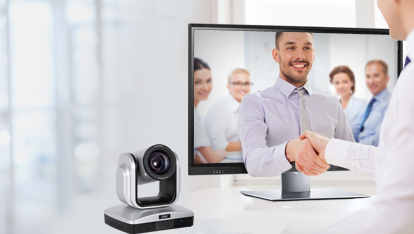 The AVer VC520 Conference Camera is an indispensable video collaboration tool for businesses that use web- or cloud-based conferencing. Learn how to use EZDraw app on Android tablets or iPads to draw, write and highlight on shared content. Up to 10 tablets can annotate the same content at one time. AVer’s Sphere2 software adds enhanced visual capabilities to lesson creation, 1:1 engagement and collaboration. AVer’s EZDraw app is a cutting-edge tool for collaborative communication on AVer’s EVC300 and EVC900 video conferencing systems. 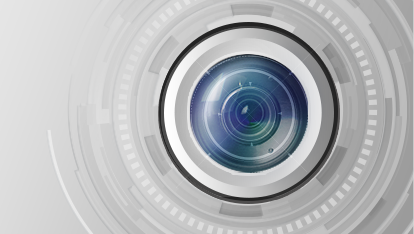 With 3D Denoise you will get better video quality even in low-light environments. With automatically activated Low Bandwidth Optimization, you will get better video quality when bandwidth is under 384K. Group calling lets you conveniently call a group of several contacts at the same time on EVC300 or EVC900. You can do the same settings both on codec and WebTool. Learn how to set up EZMeetup and call an EVC series video conferencing system, and how to call EZMeetup from an EVC series system using a user name. Learn about EVC series video conferencing systems' ports and cables, and how to install an EVC series system. Use AVer video conferencing with the goals of improving customer relationships and increasing efficiency. An alarm option, designed to save bandwidth and storage, will boost to record at the max. frame rate available when an emergency situation arises.